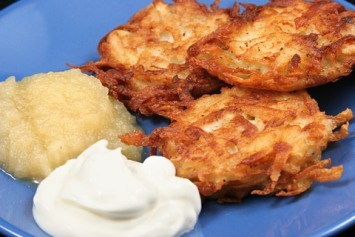 Although potato latkes are considered Jewish potato pancakes, they are actually enjoyed by many European cultures. They are an absolutely fabulous way to serve potatoes. Plus, this recipe for easy potato pancakes takes very little time at all to prepare. Grate the potatoes and onion in a food processor fitted with the grater blade. Turn out on to a clean dish towel and wrap, twisting the edges to squeeze out all of the liquid. 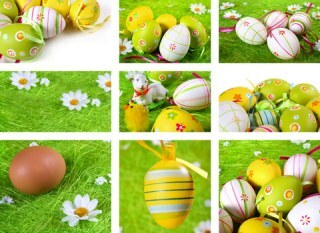 Transfer to a large bowl and beat in the eggs and matzo meal. Season with salt and pepper. Heat 1 inch of oil in a large, heavy-bottom skillet. Drop tablespoons of the potato mixture into the hot oil and cook for 2 minutes, until well browned on the bottom. Turn and cook 1-2 minutes on the other side or until well browned. Transfer to paper towels to drain. Continue with the rest of the batter. Serve warm with apple sauce or sour cream (or both). Latkes can be reheated in a moderate oven. For cheese latkes, add 1/2 cup grated, mature, hard cheese, such as cheddar, to the batter. Be careful when frying as the cheese may cause the latkes to stick. The recipe calls for matzo meal, a staple in traditional Jewish kitchens. If you don’t have matzo meal, simply substitute an equal amount of flour. That’s what I use and it works just fine. Potatoes release a lot of starchy water when they are grated. For that reason I always let the grated potatoes sit for just a minute after they are grated and before I make the pancakes. That allows as much of the liquid as possible to be released. Then wring the grated potatoes out in a towel as per the instructions above. Your potatoes will be nice and dry and will be nice and crisp when fried. There are two camps in the latke eating world. Those who love them with sour cream and those who prefer apple sauce. I prefer the sour cream. If you haven’t tried both, do, and see which you like best. What would be delicious with latkes? Try our steak and ale recipe.